We've listened to your suggestions and are happy to offer an improved version of our bread-making tool. What is a "Lame" and how do I use it? A Lame (pronounced LAHM, meaning "blade" in French) is typically a long thin stick made to hold a metal razor. This is used to cut (or "score") bread dough to help control the expansion of the loaf as it bakes. This is an essential tool for any bread baker. Setting up the Lame is easy and quick. Illustrated instructions are also included. Guarantee: If You Feel It Fell Short Of Your Expectation, Simply Return It For A Full Refund. 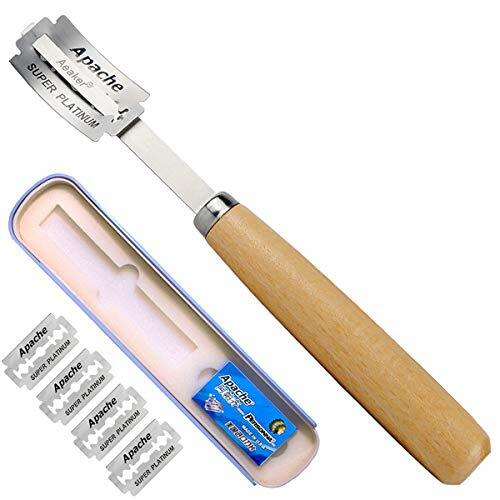 PREMIUM DOUGH SCORING TOOL: Beautifully designed lame bread slashing tool, Aeaker scoring lame will help you become a baking artist with great experience. PREMIUM WOOD HANDLE : Comfort grip handle allows for steady control and accurate cutting, Built to last. REPLACEABLE BLADES: Blades are easily replaceable with standard razor blades (5 blades included). SAFE STORAGE: Comes with a safe storage box to safely store away when done using. If you have any questions about this product by aeaker, contact us by completing and submitting the form below. If you are looking for a specif part number, please include it with your message.